Research in DNA computing and molecular programming draws together mathematics, computer science, physics, chemistry, biology, and nanotechnology to address the analysis, design, and synthesis of information-based molecular systems. This annual meeting is the premier forum where scientists with diverse backgrounds come together with the common purpose of applying principles and tools of computer science, physics, chemistry and mathematics to advance molecular-scale engineering and biology. 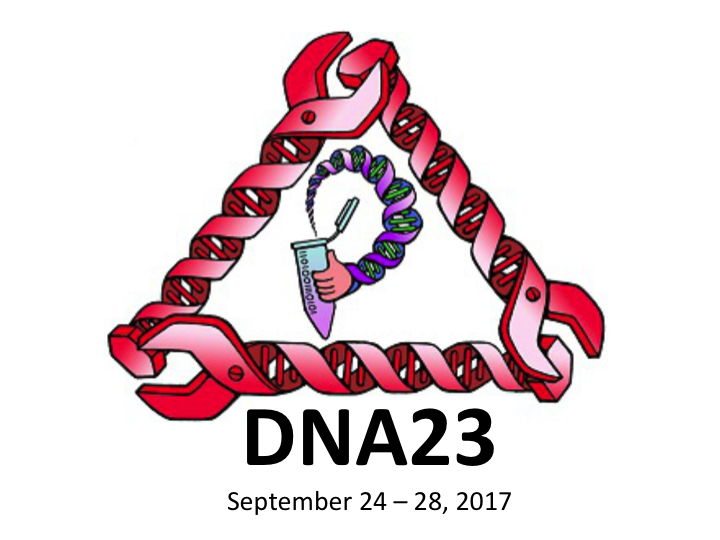 The 23rd International Conference on DNA Computing and Molecular Programming (DNA23), organized under the auspices of the International Society for Nanoscale Science, Computation and Engineering (ISNSCE), will focus on the most important recent experimental and theoretical results. Papers and presentations are sought in all areas that relate to biomolecular computing, including, but not restricted to: algorithms and models for computation on biomolecular systems; computational processes in vitro and in vivo; molecular switches, gates, devices, and circuits; molecular folding and self-assembly of nanostructures; analysis and theoretical models of laboratory techniques; molecular motors and molecular robotics; studies of fault-tolerance and error correction; software tools for analysis, simulation, and design; synthetic biology and in vitro evolution; applications in engineering, physics, chemistry, biology, and medicine. NOTE: All deadlines are firm, there will be no extensions! Electronic Submissions: All papers and abstracts should be submitted electronically following the instructions and link at the conference web page. Papers must be submitted in PDF format. The use of LaTeX is strongly encouraged for Track A submissions, as it will be required for the revised manuscript included in the LNCS proceedings of accepted papers. Authors submitting a paper and/or proposal for a presentation may choose between two submission tracks. Submissions for oral presentations can be submitted to one of the two tracks (A) or (B). The main contents of the paper should appear in the first 12 pages of the pdf. An optional technical appendix is permitted if the authors deem it necessary to back up the claims made in the first 12 pages. However, at the program committee’s discretion, this appendix may or may not be read as part of the reviewing process. The paper is formatted in LaTeX using the LNCS style. Please follow the formatting instructions at: http://www.springer.de/comp/lncs/authors.html. Each paper contains an abstract which briefly describes the primary results and their importance. LNCS series. Submissions to Track A may not be previously published or simultaneously submitted to another conference or journal for publication. A one-page abstract: The total length of the abstract should not exceed 1 page (11 point type, single spaced, 1 inch margins). The one-page abstract must describe the primary results and their importance. Accompanied documentation: Authors must attach to the abstract a preliminary manuscript, a thesis chapter or some other form of supporting documentation that can be used by the program committee to evaluate the merit of the work for oral presentation. Only the one-page abstract will appear in the supplementary proceedings at the conference. Track B papers unaccompanied by adequate documentation will not be eligible for oral presentation. The total length of the abstract should not exceed 1 page (11 point type, single spaced, 1 inch margins). The one-page abstract should describe the primary results and their importance. The conference and the ISNSCE society will award two prizes: “DNA23 Best Student Paper Award” and “ISNSCE Best Student Presentation Award”. See the conference website for information regarding eligibility. Recipients of the prize will be notified at the time of the conference banquet. If you have any questions about this call for papers, please feel free to contact the PC chair at dna23@easychair.org.